3” x 2” wood engraving of a goodboy’s sniffer. Edition of 30 (30 available). 1.75” x 2” wood engraving of the Moon. Edition of 30 (30 available). 1.5” x 2” wood engraving of the Uffington White Horse hill figure. Edition of 30 (29 available). 1.5” x 2” wood engraving of South Downs landscape. Edition of 30 (30 available). Limited edition of 15 (13 available), 30cm x 21cm. Handburnished, 12-colour reduction linoprint of a Welsh seaside cottage. Linoprint, 15.5cm x 15.5cm. Limited edition of 10 (9 available). Part of a series of seaside-inspired linoprints, this print is of a Black Headed Gull, a small seabird found across Europe and Asia. It is handprinted printed onto 150gsm handmade Indian cotton paper. Limited edition of 7 (7 available). Will fit 14”x11”/36cmx28cm frame. 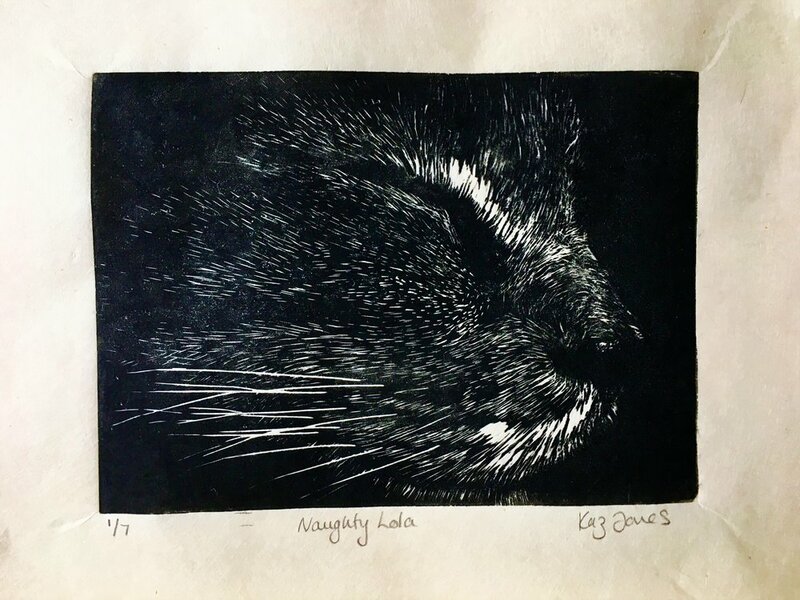 Hand-burnished linoprint of Lola Cat. Limited edition of 20 (18 available), 30cm x 21cm. A hand-burnished, hand-coloured linoprint of a swimmer. Limited edition of 25 (23 available), A5 linoprint. Limited edition of 15 (15 available). 21cm x 15cm. 6-colour reduction linoprint of a water droplet. Handburnished on Fabriano 200gsm paper using Schmincke inks. Reduction linoprint, 21cm x 15cm Limited edition of 13 (12 available). This 8-colour reduction linoprint shows the Girolata tower and mountains as viewed from the sea. Reduction linoprint, 21cm x 18cm. Limited edition of 8 (7 available). 7-colour reduction linoprint of Pentre Ifan Neolithic burial chamber, Pembrokeshire, Wales. Linoprint, 15.5cm x 15.5cm. Limited edition of 25 (23 available). 8-colour reduction linoprint, 21cm x 15cm. Limited edition of 8 (2 available). Portrait of Tigger, a lovely old gentleman of a dog who belongs to friends of mine in Pembrokeshire. Handburnished on Fabriano 200gsm paper using Schmincke inks. Image of a bee on an Helenium.